Spring may actually happen. Snowdrops appeared in my garden on Thursday. A nice clump of them poked through a tiny patch of bare soil. It was beside a large dark coloured rock that must have drawn the heat from the sun. The large patch of Snowdrops on the front yard have at least 30 cm of very hard snow still keeping them protected from the constant cold temperatures. Size and time matter. 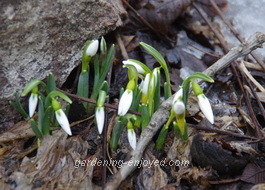 These very hardy little bulbs put up some bright white flowers that are 3 -4 cm long and they cause much excitement. They are the first and only blooms in the garden and are therefore this week’s biggest show. In June we would barely notice them surrounded by Tulips and Iris and all of the other large showy specimens. Still no sign of blooms from the Witch Hazel, my other surefire harbinger of spring. The upside of this weather is that I might get another day or two of skiing before hanging them up for the year. I’m now into that chain of events time. 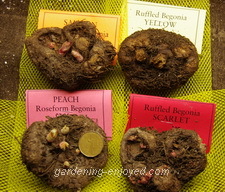 I need to sow more seeds and start the Tuberous Begonias. I bought some new ones from Garden Import’s booth at Canada Blooms. Their bulbs are always a bit more expensive than the local garden centre but they are also at least twice as big. I can’t wait to see them bloom. I did feel the need to explain to the Assistant Gardener just why these new bulbs were necessary to fill in the colour gaps in my collection. Back to the chain of events. I can’t plant seeds or start the Begonias until I transplant the cabbage, Broccoli, etc. seedlings. I can’t transplant them until there is room under the lights for them. I can’t make room under the lights until I can move the Geraniums outside into the cold frame. I did manage to put the new covering on most of the cold frame this past weekend, despite the rather cold weather. When I finish this issue of “Dallying” the sun should have moved around and be hitting the cold frame’s location and I can go out and try to finish it so that I can then move everything along the chain and get those tubers planted and the lettuce seeded. Dugald, who owns Garden Import, not only sells high quality and unusual plants but is also a clever marketer. He gives each of the garden writers who attend our meeting a gift certificate. None of my colleagues, at his booth, were spending just the value of the certificate. I thought I was very frugal and only spent twice its value, allowing me to explain to the Assistant Gardener that the Begonias were “almost” free. This week’s seeding is a lot of leafy stuff. Several varieties of Lettuce will get us on the road to a long season of interesting salads. The dressings for those salads, as well as many other delights, will be made flavouful with the inclusion of a variety of Herbs. Many of those herbs are also on this week’s seeding list. 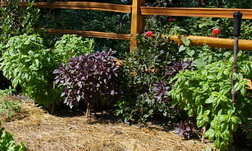 A few varieties of wonderfully fragrant Basil always top my list of herbs. Sage and Oregano are theoretically perennial here but I always start some new plants each year just in case their hardiness is only theoretical. It’s also time to go to the produce department of my grocery store and buy some Lemon Grass stalks. It is so much quicker and easier to root a couple of these fat stalks than it is to grow Lemon Grass from seed. A few seeds of Parsley will yield some curly plants that spend the summer decorating some containers as well as some meals. I have a patch of Arugula that seems to self seed all over a part of the rock garden and we can’t seem to eat enough of it, to stop its spread. Nonetheless I will start some more seeds of the regular Arugula as well as a Wasabi Arugula that I discovered a few years ago. Not that easy to grow but provides the familiar flavour of Arugula as well as the distinctive heat of Wasabi. Anita Asks? I started a whorled begonia leaf in water last Thanksgiving. After a month I planted the roots in a pot of dirt. Finally after three months I have several small new leaves coming up out of the soil. Do I cut off the old leaf that all this started from or just leave it? Ken Answers! Those new leaves should eventually turn into several small plants. When they do, separate them from the old leaf and each other and plant them individually. Now you can toss what is left of the original leaf. Mandy Asks? What fertilizer do you use on your hibiscus,???? last year for the first time I fertilized my hibiscus and thought I had killed them all ,the leaves fell of like rain, they are five years old, never been fertilized, or transplanted, I think that they were shocked by being treated too well. Ken Answers! After the great pruning, I use a soluble 20 20 20 fertilizer in the first watering and then continue to do so every third or fourth watering. My big Hibiscus has been in the same pot for several years. If it was any bigger, getting it in and out of the house each spring and fall would be difficult. Spencer Asks? I have a question about the timing involved in seed-starting. I'm located in Ajax and the average last day of frost is May 9 I believe. On seed packets for tomatoes it says to sow the seeds indoors 6 weeks before the last day of frost. I have also read an article in the newspaper where it said you should sow tomato seeds 6 weeks before they are transplanted into the garden, which would likely be around the end of May. May 9 to the end of May is more than a 2 week difference. What are your beliefs and suggestions on the timing of when to start tomato as well as pepper plants? Ken Answers! 6 - 8 weeks before they are planted in the garden is a good rule for both Peppers and Tomatoes. The real question is when to plant them in the garden. Neither of these vegetables likes cool weather. Mine never make the garden before the end of May or the first week of June. There may not be any frost for a few weeks before then but there will be cool nights that will stop these plants from flowering and slow their growth. Check out my page on seeding times for a fuller explanation of what I plant when.